Interstitial Lung Disease and Gastroesophageal Reflux Disease: Key Role of Esophageal Function Tests in the Diagnosis and Treatment. Background: The high prevalence of gastroesophageal reflux disease (GERD) in patients with respiratory disorders, from asthma to idiopathic pulmonary fibrosis, has led many to speculate that there might be more than a coincidental association between the two disease processes. There is still confusion about the diagnostic steps necessary, and about the effect of treatment. Objectives: To determine in patients with interstitial lung disease (ILD) (a) the prevalence of GERD; (b) the sensitivity of symptoms in the diagnosis of GERD; and (c) the role of esophageal function tests (EFT: manometry and 24-hour pH monitoring) in the diagnosis and treatment of these patients. Methods: Retrospective study based on a prospectively set database of 45 patients with ILD: 25 patients had idiopathic pulmonary fibrosis, 14 pts had connective tissue disorders, 5 patients had sarcoidosis and 1 had interstitial pneumonitis. The average FEV1 (% predicted) was 72%. All patients had EFT. Results: Twenty-nine (64%) had pathologic reflux (average reflux score: 51, normal < 14.7). The average number of reflux episodes recorded 20 cm above the LES was 27. The sensitivity and specificity of heartburn were 69% and 56%, for regurgitation 45% and 62%, and for dysphagia 31% and 68%. Ten patients underwent a laparoscopic fundoplication tailored to the manometric profile: 2 patients had a Nissen fundoplication and 8 patients had a Dor fundoplication. They are all stable from a respiratory point of view and asymptomatic at a median follow-up of 6 months. 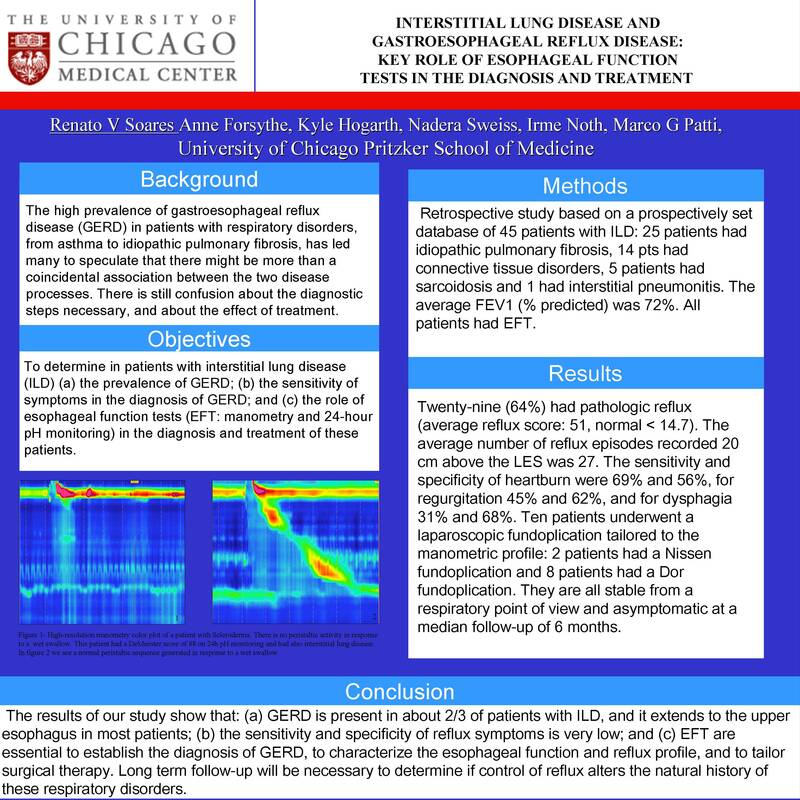 Conclusions: The results of our study show that: (a) GERD is present in about 2/3 of patients with ILD, and it extends to the upper esophagus in most patients; (b) the sensitivity and specificity of reflux symptoms is very low; and (c) EFT are essential to establish the diagnosis of GERD, to characterize the esophageal function and reflux profile, and to tailor surgical therapy. Long term follow-up will be necessary to determine if control of reflux alters the natural history of these respiratory disorders.